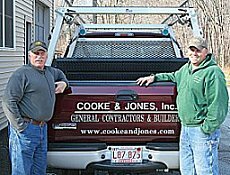 We have been in business Since 1946 and specialize in all aspects of residential and light commercial construction. This includes everything from additions to remodeling. Our goal is to provide our clients with a strong responsive construction team that knows how to work together to get the job done correctly, on time,within budget and with pride. By providing premium quality services, we've earned respect by exceeding your expectations. We work with you to ensure that each project is done right the first time. While you are visiting our website, be sure to visit each area. We trust that you find a lot of useful information on the following pages. If you would like additional information that is not contained on this site, please call (413) 773-3634 or click here to email us. Hard work, ambition, safety, honesty and the desire to be a superior presence in a demanding business have won our reputation of quality and dependability. Our company was founded on the premise that quality construction principles and attention to detail should be unwavering standards. And it doesn't stop with the construction of a project. Service afterward has always been a part of our tradition and commitment to service. Quality craftsmanship and attention to detail go into each and every project. Our projects are consistently completed on time and on budget, delivering a top quality, cost efficient and functional project to our clients. We offer a wide range of cost-effective design solutions without sacrificing architectural aesthetics. We strive for originality, good taste, and excellence.